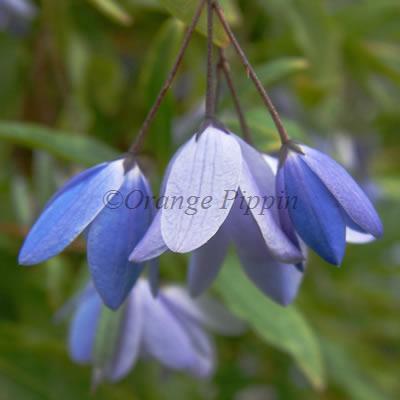 Sollya heterophylla, also known as 'The Australian Bluebell Creeper' which was where it was discovered, is an evergreen climbing plant with slender stems that covers itself in masses of beautiful, small, sky-blue bluebell-like nodding flowers during the summer and autumn followed by purple or blue berries. Sollya heterophylla was discovered in the wilds of Australia in the 1830's by British plant physiologist Richard Horsman-Solly. 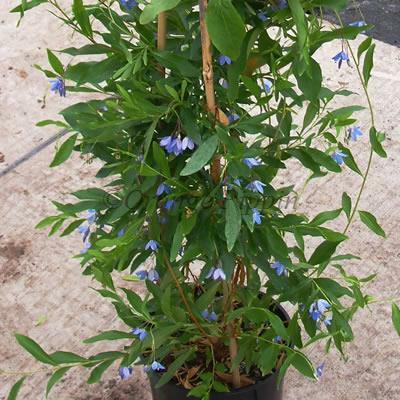 This gem of a plant, although ideal for growing against a sunny wall or fence in full sun or partial, dappled shade will require frost protection, so is best grown in a patio container, trained up an obelisk where it can be moved indoors for the winter. It can also be grown in a warm conservatory or heated greenhouse.